CoriaWeb Review 2019: Is CoriaWeb a Good Hosting? CoriaWeb is a great provider of straightforward, solid shared and VPS hosting. To ensure high-quality and high-performance, they make use of great hardware such as SSD NVMe storage devices. CoriaWeb is named after the area in which the company was established: Coria del Rio in Sevilla, Spain. With almost 3,000 customers and more than 6,000 hosted domains, they are one of the country’s up-and-coming hosting providers. Their catalog includes shared hosting products as well as virtual Windows and VPS Linux solutions, and while their main ‘commercial’ website is available only in Spanish, their customer area can be switched between several different languages. CoriaWeb’s hosting products come with a pretty solid list of features, and all the essentials are covered to make sure you get everything you need from a single provider. The powerful cPanel is the control panel of choice that provides plenty of tools, apps, and control over your hosting. The use of DNS cluster technology gives you better availability and performance over a wider geographic area while you can have some flexibility and scalability with a one-click upgrade. CoriaWeb’s VPS packages can satisfy more intensive requirements with up to 2,200GB of traffic, 80GB of storage, 12GB of RAM, and four dedicated IP addresses out-of-the-box. They also provide Windows with Plesk hosting if this is your preferred platform, and two of their “extra value” features are GZIP compression and Pyxsoft Anti Malware. Although they’re nowhere near being expensive, CoriaWeb is certainly not cheap. However, if we look more closely at what their hosting packages come with, the prices seem more than justified. Shared web hosting comes with SSD NVMe storage, a Let’s Encrypt SSL certificate, a free domain (privacy costs extra), and free website migration. It’s also worth noting that all their packages are multidomain. It’s unfortunate that there is only yearly billing for shared hosting, but the sign-up risk is mitigated somewhat by the 15-day money-back guarantee that guards you against making a big mistake. You can get a monthly billing option with Virtual Windows hosting but at the expense of losing most of the freebies that come with the shared hosting. VPS hosting comes with a free SSL certificate and monthly billing but no free domain. In this case, you only get a 7-day free trial. 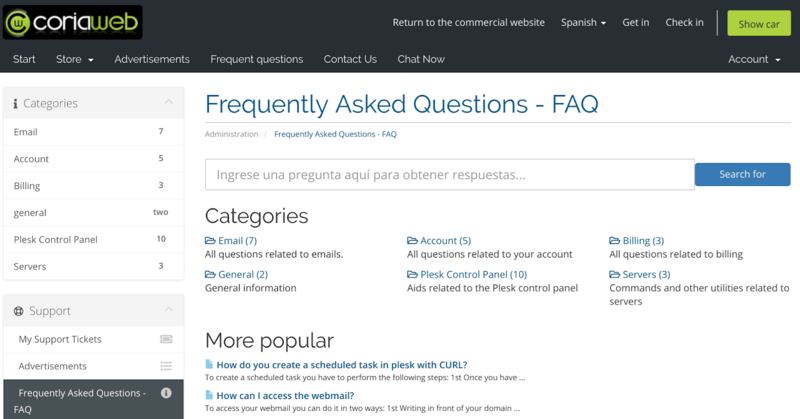 CoriaWeb offers 24/7 technical support with all of its products, which you can access via phone, live chat (not always available), or their email/ticketing system. You will get swift responses from the helpful and courteous staff. If you like to support yourself, you will find a knowledge base which (in my opinion) could do with a broader range of topics. CoriaWeb might not offer the widest range of hosting features or have the lowest prices, but their all-in hosting and easy-to-use service make them an attractive option. Wondering how CoriaWeb stacks up against other Web Hosting companies? Enter any other Web Hosting company and we will give you a side-by-side comparison.